Tea, coffee, red wine, and tobacco all can tarnish your teeth, leaving you with a lacklustre smile. At Narre Warren Dental Care, we’ll accentuate your pearly whites by getting rid of stains that keep your smile from being its brightest. The first step is to consult one of our dentists for a checkup to ensure that teeth whitening is right for you. If you decide to proceed, you’ll be booked for a one-hour appointment. We offer the following whitening options that you can do in the office or at home. By having your teeth whitened in the office, you’ll get gorgeous results in about an hour, allowing you to brighten your smile during your lunch break. The process is simple: a whitening gel is applied to your teeth and accelerated by the use of a LED light. Your teeth can get up to eight shades whiter. With this option, you can whiten your teeth from the comfort and convenience of your home. You can get a remarkably whiter smile in about a week though results may vary. 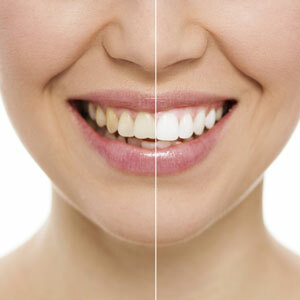 Imagine getting whiter, brighter teeth with just 30 minutes of treatment time. With polaoffice+ you can! That’s because the office version of the product contains 35% carbamide peroxide solution. Your dentist will determine your tooth colour using the Pola shad guide and then will estimate how many shades lighter you would prefer your teeth to be. If you prefer to whiten your teeth at home, we offer poladay and polanight. With poladay, you can achieve the level of whitening in as little as 30 minutes a day. Prefer to whiten while you sleep? Then polanight is the ideal whitening option for you. You can preserve your whitening investment with biyearly scale and cleans. Get the gleaming white smile you’ve always wanted! Contact us today to schedule your time with our experienced team. To accommodate your schedule, we offer Saturday visits and have flexible hours.